Baglama Tuner is a tool for tuning Turkish musical instrument Baglama. It both listens to instrument sound and measures the sound frequency and produces sound when touching the strings on screen. 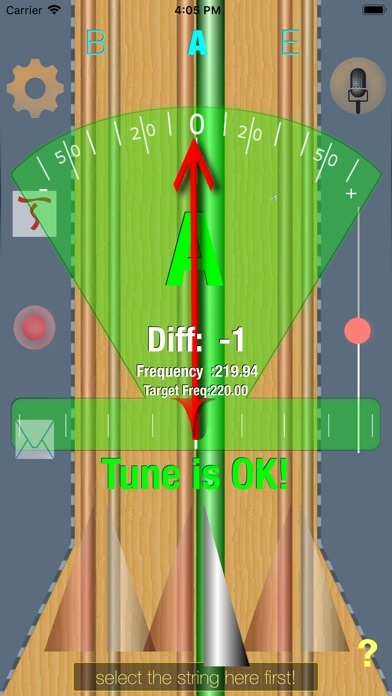 You should select the keyboard length, tune style and mode before starting tuning. In custom mode selection you can tune to any tone without limits. In the tuning window you should tune strings one by one by selecting each string with triangle buttons at bottom. You will be guided to higher - lower tunes to find the right tune. You can follow the red arrow to come to centre with Diff value 0.00 for identical tune. Yo can also see a library of lyrics of Turkish songs offline.